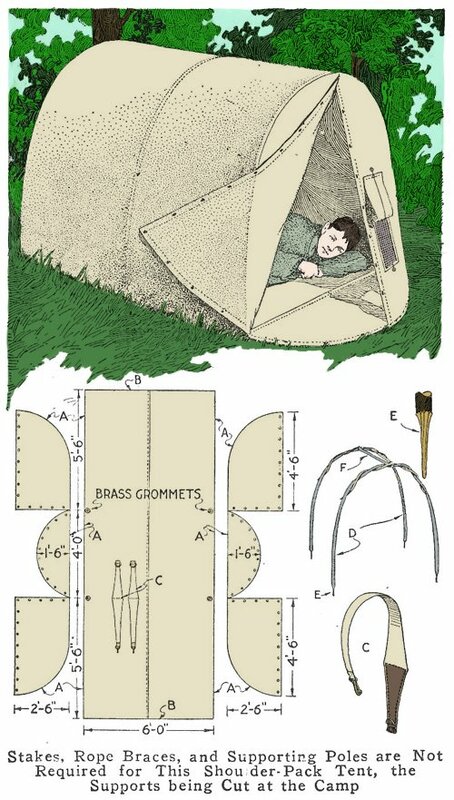 After sleeping under various kinds of canvas coverings and not finding any of them entirely to my liking, I made the tent shown in the illustration, which proved quite satisfactory. It is of light weight, easily set up or taken down, and when buttoned closely it is practically rain, wind, and bug - proof. The cost of materials necessary for making it is comparatively slight. I use it not only as a sleeping tent but also as a carry-all in packing camping equipment. The canvas is supported by frames made of pliable branches cut in the woods. The layout for the canvas is shown in the detailed drawings. The sections for the ends are made of three pieces, one for the ground and two, divided vertically, for the end covering. The ground section of the main portion of the tent and the covering are made in one piece, 6 ft. wide, joined at the middle, as shown. The adjoining “A” are sewed together and the edges “B”, which are set at the ridge of the tent, are sewed, after the other pieces are joined. 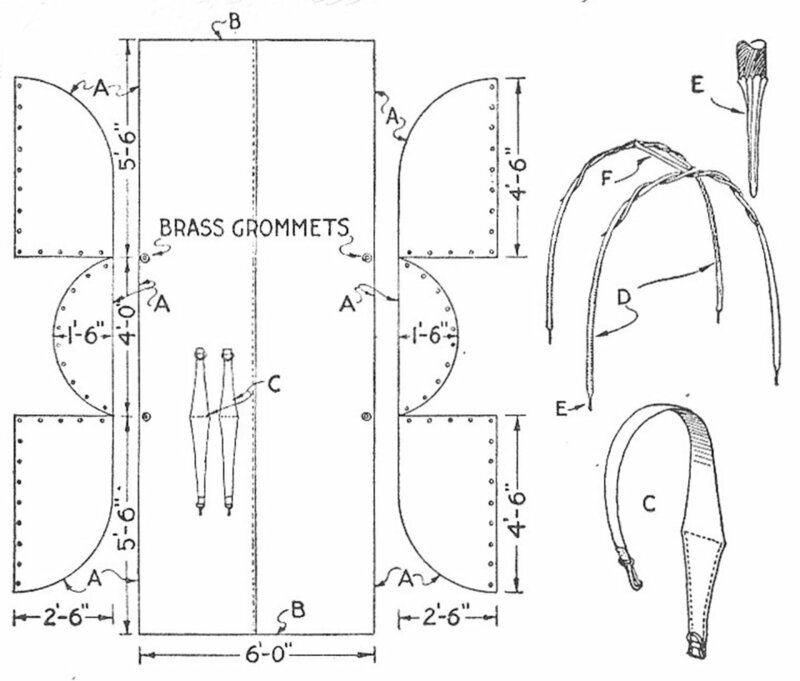 Brass grommets are fitted in the canvas, as indicated, and the points of the supporting frames pass through them in driving the supports into the ground. The shoulder straps “C” are placed so that they are in position when the tent is folded, and rolled into a pack. Other equipment may be placed inside of it. The tent supports “D” are pointed at the ends “E”, and are twisted together at the top. The ridge pole “F” steadies them and holds the canvas at the middle. To set up the tent, lay the canvas flat on the ground and place the supports, twisted together, through the grommets. Spring them into the ends of the canvas, and insert the ridge pole by springing it between the supports. The canvas is 8-oz. duck, and the fastenings used are snap buttons, buttonholes, buckles, or harness snaps may also be used.